Interstate 885 will run along the Durham Freeway (N.C. 147) north from I-40 and the Triangle Expressway (Toll N.C. 147) at Research Triangle Park to the East End Connector. Anticipated to open for traffic in November 2019, the East Connector is a 1.25 mile long roadway under construction between the Durham Freeway and the east Durham bypass (U.S. 70) near East End Avenue. I-885 will overlay U.S. 70 northward to Interstate 85 & U.S. 15 at Exit 178. Right of way acquisition for the East End Connector commenced in April 2012. Construction on the $142-million project was pushed back from April 2014 to a starting date in February 2015. Work runs through May 2020. NCDOT will submit Interstate 885 to the American Association of State Highway and Transportation Officials (AASHTO) at a future meeting for the planned corridor between Interstates 40 and 85. 2014 sign schematics by NCDOT already show the route acknowledged for the East End Connector. A directional T interchange joins the north end of the U.S. 70 bypass freeway through east Durham with Interstate 85 and U.S. 15. This interchange was upgraded as part of a $210-million project in 1999-2008 to expand and modernize I-85 through Durham (Exits 173 to 178). A three-quarter cloverleaf interchange joins the south end of the Durham Freeway, north end of the tolled Triangle Expressway and Interstate 40 within Research Triangle Park. Directional ramps connect NC 147 south with I-40 east and I-40 west with the Durham Freeway north. I-885 will overlay NC 147 northward to the East End Connector. 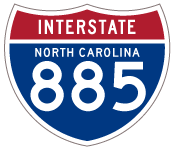 “New Interstate 885 in Durham” online posting by bob7374, AARoads Forum, August 19, 2014. Page Created August 20, 2014.